On the banks of the Dnieper River is the glorious city of Zaporozhye. It is the administrative center of Zaporozhye region, as well as one of the largest industrial centers in the south of Ukraine with developed industry and mechanical engineering. Today it is a transit railway junction of Ukraine, as well as an important river port. Zaporozhye is known as a stronghold of the Ukrainian Cossacks and is famous for its picturesque island Khortytsya, viewed from a huge dam DnieproGES . In the past, this place housed the crossing, which floated on the tribes of the Scythians, Pechenegs, Cumans, and later the Turks, Crimean Tatars. Here, as in the late 15th - early 16th centuries ran the Cossacks. In 1552, Prince Dmitry Vishnevetskii laid the castle on the island of Baida, which is also called the Little Khortytsya. History Zaporozhye began with 1770, when the castle was built by Alexander, who became an outpost in the Russian-Turkish war. Later it emerged Oleksandrivsk city, and in 1921 it was renamed in Zaporozhye. When you arrive in this city, the first thing he will amaze you with its monumental architecture, with strong elements of the Empire style. In this you can see for yourself by visiting one of the longest avenues in Europe - the avenue named after Vladimir Lenin. Interestingly, in the 1932 draft of the architectural ensemble of the central part of the city was awarded a gold medal at an exhibition in Paris. There is a building on the avenue of Music and Drama Theatre named Magara . You can also visit the National History Museum and Museum of the History of weapons. 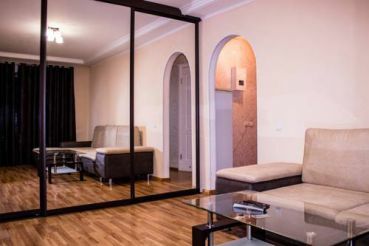 Reach the main avenue of the city can be directly from the train station by taxi № 46, № 62 or number 61. Zaporozhye lovely any time of year. However, it is best to visit in the summer or fall, when particularly beautiful. Green pearl, a treasure trove of history Ukrainian Cossacks, one of the Seven Wonders of Ukraine called the largest island, located on the Dnieper River. This - the legendary island of Khortytsya . It impresses the beauty here are forests, meadows, marshes and cliffs of granite shores. Rocks are especially attracted to the island of lovers of extreme sports. Climbers can be seen in the northern part of the island - here are some cliffs reach a height of 40 meters. Khortytsya is also a cultural and historical reserve, as its territory preserved many ancient monuments. Archaeologists have discovered pagan sanctuary in the form of small "Stonehenge", mounds, statues of gods who have survived from the warlike Scythians. 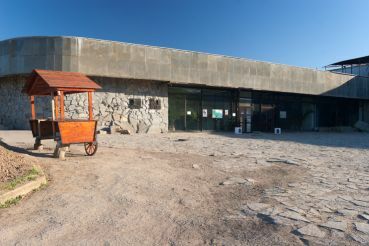 Now these sites are included in the memorial and tourist complex called "Scythian camp." Khortytsia was also recreated Zaporizhzhya Sich. It was the legendary site of the Cossacks, who later became the center of Cossack state. 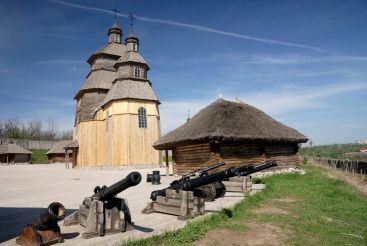 Today Zaporizhzhya Sich - historical and cultural complex, which is a reconstructed castle, church and part of the Cossack dwellings palisaded and surrounded by a moat. Nearby is a museum that is dedicated to the history of the Cossacks, and four dioramas depicting different time periods in history Khortytsia. Nearby is the highest mound of the island, with a magnificent view of the Zaporozhye Dnieper dam, on the very Khortytsya and part of the city. In the southeastern part of Khortytsia acts equestrian theater "Zaporizhzhya Cossacks." Equestrian performances are held here in the spirit of Cossack times. Having been at one of these performances, you will see a variety of tricks performed once Cossacks on horseback. From the center of Zaporozhye on Khortytsya can be reached by taxi № 55, № 62 and № 95. Pride of Zaporozhye is DniproHES Vladimir Lenin, commissioned in 1932. Length of the dam is 236 meters, width - 56 meters. It connects the left bank and right-bank part of Zaporizhia. Hydroelectric led to the flooding thresholds, which in turn allow a ship to go down smoothly on the Dnieper.Near HPP monument to its founder Alexander Winter, as well as the unknown soldier who saved the power plant from destruction during the Great Patriotic War. The building itself is a museum Dnieper HPP, which allows you to learn about its history and see the turbine working in the engine room. To hydroelectric power from the island Khortytsya you can reach by taxi number 96 and number 89. Visiting the famous city Zaporozhye, adjoin with the past of the city and enjoy the natural beauty of this region. За твердженням дослідників, святилище датується приблизно 3 тисячоліттям до нашої ери. На цьому місці давні люди здійснювали язичницькі ритуали. Віднедавна стародавню пам’ятку можуть відвідувати і туристи. У Національному заповіднику «Хортиця» відреставрували два стародавніх судна: дюбель-шлюпки 30-х років 18 століття і байдак 19 століття. Відтворювати подібні кораблі фахівцям складно, тому що немає креслень першої половини 18 століття. Використовуючи закордонний досвід, реставратори зробили металевий каркас, на ньому розмістили вцілілі фрагменти декількох однотипних дюбель-шлюпок. Приглашаем Вас посетить город с удивительной историей - Запорожье! Запорожский край - это место легенд и славного прошлого. А наша поездка - это не просто экскурсия, а настоящее путешествие во времени! Мы окунемся во времена казачества: посетим Запорожскую Сечь и узнаем, как жили казаки много веков назад.Вас ждет увлекательное путешествие на пароходе по Днепру из города Запорожье. Во время речной прогулки мы сможем полюбоваться известной Хортице с необычного ракурса, насладиться живописной красотой берегов Днепра с палубы парохода. А еще, Вы станете непосредственными участниками наиболее волнующей части маршрута - спуска через шлюзы Днепрогэс! Хотите узнать тайну изготовления пива Carlsberg, увидеть, как жили казаки и увидеть оружие разных народов мира? У Вас будет такая возможность!Приглашаем отправиться в незабываемое путешествие в город с удивительной историей - Запорожье.Мы отправимся на экскурсию на пивзавод Carlsberg Ukraine, во время которой воочию увидим весь процесс изготовления пива. Что же превращает воду и хмель в этот популярный во всем мире напиток? Как правильно выбрать качественное пиво? Современные технологии используют на заводе? После этой экскурсии вы станете настоящим пивным экспертом! А еще, сможете продегустировать лучшие образцы пива и кваса.Также, мы побываем в музее "Запорожская Сечь", где узнаем о жизни и быте казаков.И напоследок заглянем в музей оружия, где представлена ​​уникальная коллекция в разные периоды времени.